The Hyaenodon is one of the Creatures in ARK: Survival Evolved. Among the Island's most tenacious pack is Hyaenodon dirus, a carnivore most often found across the mountains and tundras in packs of 3 to 6. The Hyaenodon is a very intelligent predator. Before engaging, it determines if the payoff for a fight is worth the risk of injury. ...and the pack attacks with ruthless abandon. With each vicious chomp of scavenged meat, the Hyaenodon rapidly recovers health and stamina. Despite being too small to ride, Hyaenodon are still popular pets. Their intelligence means they train well, and their natural pack mentality makes them excellent hunting dogs. Their ability to quickly recover health by consuming raw flesh off the bone ensures they can take punishment yet continue to fight, and they can efficiently preserve meat in specially-crafted saddle-bags. A common (and terrifying) sight on the tundra is a rider on a Canis with a pack of Hyaenodon at its side, howls and jeers echoing through the night. Hyaenodons are very smart. They will determine if the reward is worth the risk. Their opportunistic behavior means they'll only fight you if you're injured. The Hyaenodon is a vicious, carnivorous pack hunter found in mountains and cold regions. They resemble modern hyenas. This section displays the Hyaenodon's natural colors and regions. 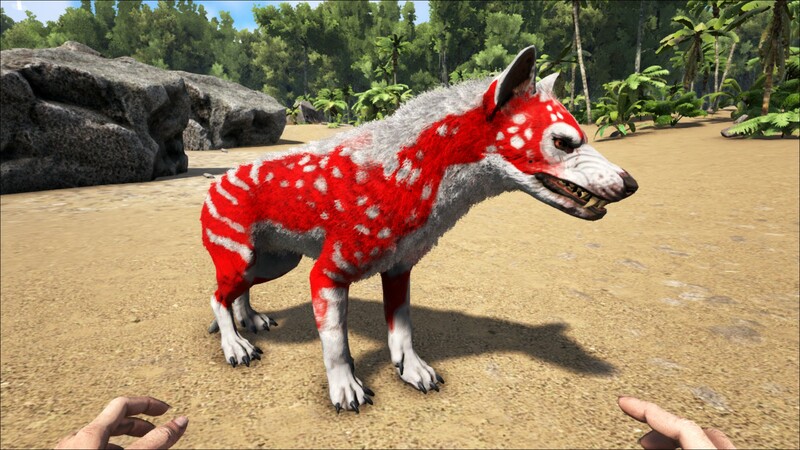 For demonstration, the regions below are colored red over an albino Hyaenodon. The colored squares shown underneath each region's description are the colors that the Hyaenodon will randomly spawn with to provide an overall range of its natural color scheme. Hover your cursor over a color to display its name and ID. 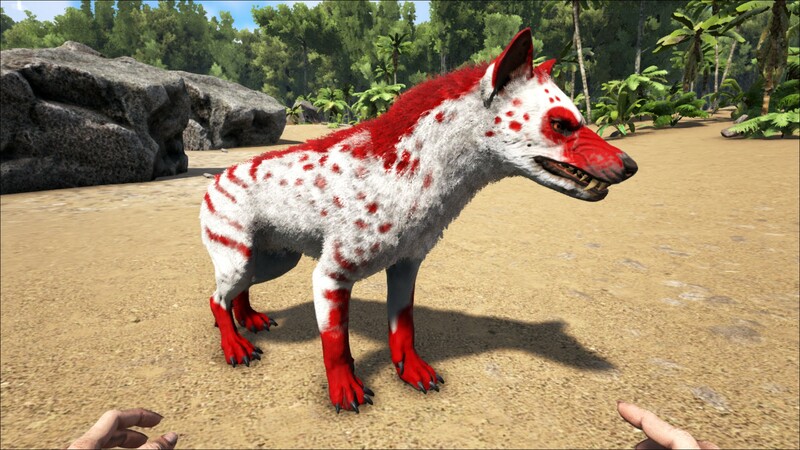 For example, "cheat SetTargetDinoColor 0 6" would color the Hyaenodon's "main body" magenta. The Hyaenodon is unable to be tamed through the standard tranquilize-and-feed methods, and must be tamed non-violently. You do not use any type of food to tame the Hyaenodon. The game will prompt you to pet it every 30 seconds while crouching. However, it must be far enough from the leader in order to receive this prompt. Be sure to stay on top of this, the taming percentage will drop very quickly if you fail to pet within the following seconds. You can create a taming cage using foundations and ceilings. You use the foundations to anchor the ceilings and make a hollow box in the center. Next add some walls and a ramp to make a more conventional taming trap. Lure the Hyaenodon into the trap and then you can crawl under the ceiling and pet it from there, making it far less likely to detect you. Ghillie Armor is recommended. Once tamed the Hyaenodon will eat raw meat like any other carnivore. They have low health and can be killed with a sword, a pike, or a tamed Dino; they pose no threat besides when they are in their packs. Usually they run away, though it depends on their pack size. What a Hyaenodon lacks in singular strength, it makes up for in numbers and pack bonuses. Finding a single Hyaenodon in the wild is not likely, but will be easily frightened and begin running away. A small pack of 3 will wait to find easy, already injured prey. A pack of 6+ Hyaenodons will be more willing to attack on sight. Using big AoE attacks from a larger dino is perhaps the easiest way to deal with a pack. On foot, you'll want to find some kind of terrain advantage, a rock or cliff of some sort, to deal with them from safe range. Ranged combat is advised from a safe location if you need to kill all of them. Accuracy will be critical, as their fast movement makes them hard targets. If all else fails, a pike will be your best friend. Its range, knockback, and rate of attack will benefit compared to the sword, unless a shield is used effectively. Hyaenodons like to swarm opponents with brute force to end a battle quickly. A large pack will still give higher level players something to fear. Be careful, every pack has an Alpha that hits harder than the others. Hyaenodons will attack unconscious dinos. 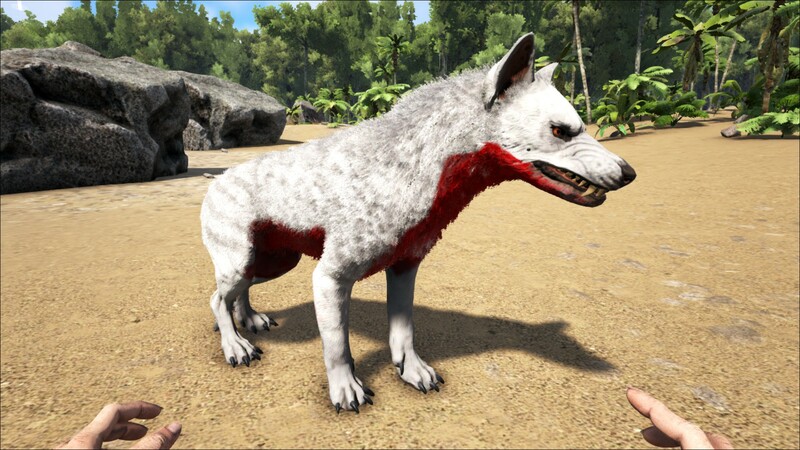 Hyaenodons have low health and will flee if they're opposed by multiple players with big creatures, or if some of them (especially the pack leader) are killed. They also have a huge turning radius. A smaller pack will try to flee from Sabertooths of a higher level so you can easily reap them. According to the dossier, the Hyaenodon will be capable of healing itself quickly via collecting meat from dead bodies. Additionally it has "saddle bags" craft-able for it, even though you cannot ride it. The bags allow the Hyaenodon to act as a living fridge, increasing the spoil timers of food placed in its inventory. With the saddle bag equipped, most items with a spoil timer last twice as long as they normally would in a creature inventory, 8x longer than the default spoil timer. Placing preserving salt inside a Hyaenodon's inventory which also has a saddle bag, has the potential to increase the spoil timer of applicable items to 16x longer than in a player inventory. Notably wyvern milk and organic polymer are not affected by the saddle bag's special ability. The dossier was revealed on December 1, 2015. The size of the Hyaenodons are very varied. It goes from the size close to the Direwolves of the game (Hyaenodon Gigas) to that of a weasel (Hyaenodon microdon). The size of the Ark Survival Evolved Hyaenodon is close to that of the Hyaenodon horridus. 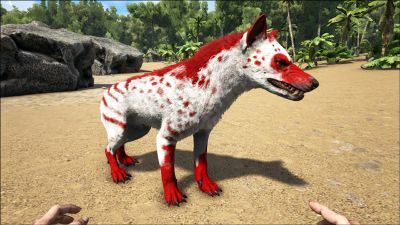 In the game, the Hyaenodons look almost the same as hyenas as of now, even if they are not related. The Northernmost sandy beach of the Western Coast (see the spawn map) is the best location to find Hyaenodon. They spawn frequently and in large packs there. The search zone is small and visibility is good.